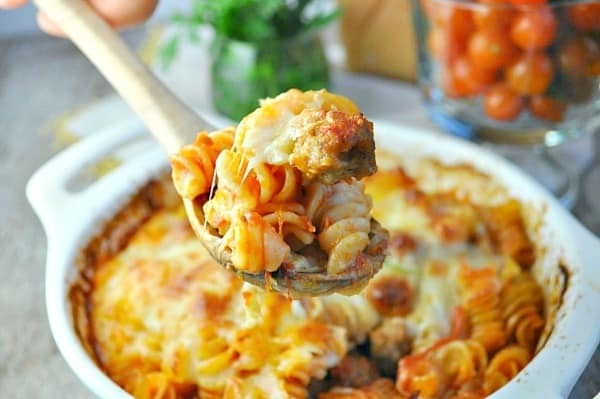 ​​​​​​​You don't even have to boil the pasta for this easy Dump and Bake Meatball Casserole! With only 5 simple ingredients, family-friendly weeknight dinners don't get much better than this! Hi, friends! I’ve been busy this fall coming up with easy weeknight solutions to help you get dinner on the table FAST. 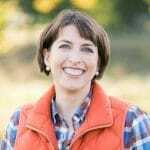 After all, I figure that when I have a parenting obstacle to deal with, odds are good that there are a lot of other moms out there who are also facing a similar dilemma. and that everyone actually loves. This dump-and-bake supper is absolutely one of those meals! Italian cuisine (and pasta specifically) is always a big hit in my house. 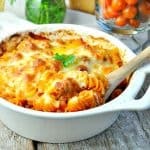 The best part of this comfort food casserole, however, is that YOU DON’T EVEN HAVE TO BOIL THE PASTA!! Awesome, right? You literally toss together some dry pasta, some frozen (fully cooked) meatballs, marinara sauce, and water in a big baking dish. Cover it and bake it in the oven while you deal with laundry, homework, feeding the dog, and all of the 18909809832429508 other items on your “To Do” list. Sprinkle some cheese on top to melt at the end and dinner is DONE! I hope that your family loves this simple, home-cooked supper as much as we do! 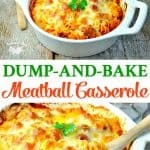 Enjoy this quick and easy Dump-and-Bake Meatball Casserole that comes together with just 5 kitchen staples! 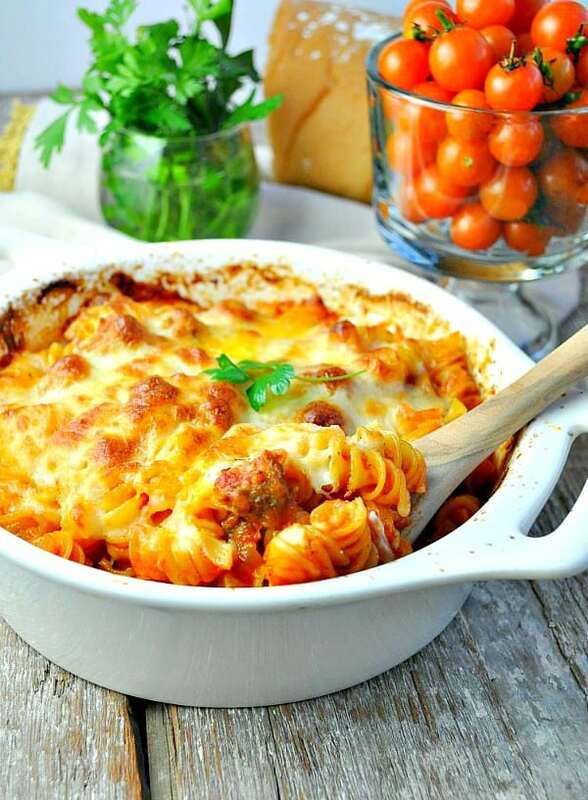 If you’ve tried this Meatball Casserole or any other recipe on The Seasoned Mom, then don’t forget to rate the recipe and leave me a comment below! You can follow me on Facebook, on Instagram, on Pinterest, and on Twitter! Cooking for a smaller family? Cut the ingredients in half and bake in an 8-inch square dish. Previous Post: « Fall Into Fitness: Week 2! Wow does this casserole look good, Blair! My husband would love this! I’m always on the hunt for easy weeknight meals, too, so this looks just perfect! Thanks, Gayle! It’s definitely a dinner that our husbands can get behind! It says cook time is 50 minutes but the recipe says total 40 minutes. Does the water have to be hot, cold, room temperature? Hey, Karen! Sorry for that confusion with the cooking time! I just updated the recipe to correct it. You’ll want to bake it for 30 minutes covered, and then stir, add the cheese on top, and pop it back in the oven for another 10 minutes or so until the cheese melts and the pasta is tender. Hi, I tried this tonight as my children loved it! But you have for it to cook 1st for 35 mins…I did everything you said and I ended up having to put it back in for 20 more mins. Weird. Could your oven temperature be a little off? Was your oven completely preheated? I’ve made this twice now, and it’s been a real hit. Great recipe! This not only looks delicious, but beautiful as well. I can’t wait to try this recipe out. I am going to social media blast this! Thanks for posting it on Jebbica’s World Link Party today. Thanks so much, Trisha! I’m so glad that you stopped by! I want this for dinner tonight!! This looks so delicious and so fast to put together! No noodle boiling? YES! Can’t wait to try this one out! Total comfort food, right?! Thanks, Anna! Thanks, Shelly!! 🙂 It doesn’t get much easier, right?! Do you use regular noodles that don’t specifically say oven ready? Quick reply would be great as I wanna make it tonight! Made this tonight and it was simple and delicious. It took me about 30 mins extra to cook at a temp of 425. What type of noodles did you use? Can they be regular rotini not oven ready ones? Do you think penne pasta would work just as well? Hi, Nicole! I’ve used penne in other dump-and-bake recipes on my site (like this one: https://www.theseasonedmom.com/dump-bake-penne-alla-vodka/), and it definitely works well. I would suggest baking the casserole at 425 degrees for a total of about 45 minutes, but check your pasta towards the end because the cooking time can vary depending on a few factors (type of dish, the heat of your oven, type of pasta, etc). Enjoy! This looks incredible! Could this be made in the slow cooker? I picked 4 easy recipes from the group to make. I am not a young Mother but have been there & done that. As I get older these dishes fit with my lifestyle. I like the idea I can have everything on hand as the Winters here are nasty. I do think Aunt Bee & I would get along. Now saying that, do you think I could get in on the care packages? Have a lovely weekend Blair. I made this tonight, after 30 minutes the pasta was rather crunchy. Is this normal before putting the cheese on? I know this will be a hit and a “make again” – just want to make sure I didn’t do anything wrong 🙂 also, what size (qt) caserole dish did you use? Hi! I’m so glad that you tried this recipe. 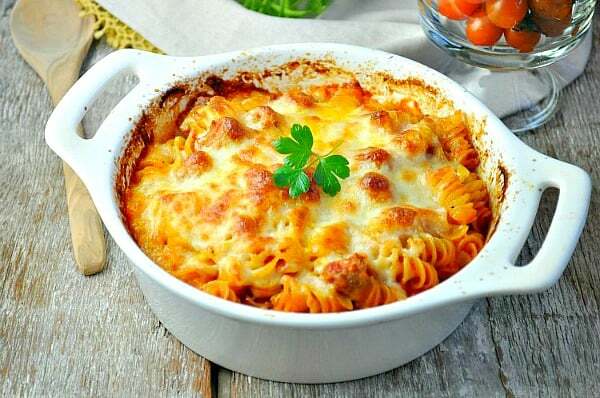 🙂 By the time that you put the cheese on top, the pasta should almost be done (not crunchy). Did you have it really tightly covered (you want to make sure that the pasta can absorb all of the liquid without it escaping)? Was most of the liquid absorbed by the pasta at that point? It might just need a little bit longer in your oven? Also, the size/type of pasta that you used could make a difference. I have used both rotini and a mini penne, which work well. Something larger would definitely need more time, though. Thanks for the feedback, Julie! 🙂 Maybe next time?! I had this same experience. Crunchy noodles and annoyed hungry kids. 🙁 I had to add more water and cover again and by the time it was done the cheese was ruined. I wish I’d read the comments first and cooked it longer to begin with! Also it would not let me rate it on mobile, I’m sorry. It’s not a no-stArs recipe! Hi Blair – this looks awesome! I’d like to make it in my Le Creuset for an Oscars party this weekend… what are the recommended measurements if I want to double the amount? You will probably need to use two large baking dishes, because I’m not sure that one dish alone will hold everything (unless you have a very deep 9×13-inch dish…that might do the trick)! Cook time should be the same! I tried this last week when I had some leftover meatballs. Fed it to some guests for dinner with and it was a hit. The mister is now demanding to have this dish served at least once a week for dinner. I packed it for my office lunch the next day as well, so amazing! Oh, YAY!!! I’m so glad to hear that, Sharday! My husband and boys always love it, too. 🙂 Thanks for letting me know! Made this for dinner tonight and it was great! Like several others, I had to cook it an additional 20 minutes covered before adding the cheese in order to get the pasta done. Rave reviews from the family! This dish will definitely be a regular in our household! Thank you Blair! Oh, thanks so much for letting me know, Becky! I’m glad that you enjoyed it!! Can you make the meatballs for this? Will that change anything about the recipe? Hey, Ashley! You can definitely make the meatballs for these — just be sure that they are fully cooked before adding them to the casserole. Enjoy! Hi! my fiancé always wants me to cook so I’m going to try this dish looks great. I never been too much of a cook but now I am trying especially with my new family so Thanks! Hi, Angel! That’s great! I hope that you both really enjoy it! I made this for my family and it was excellent! I didn’t change anything and it came out perfect, I was so impressed! Thank you for this recipe. Awesome! So glad that you liked it, Elizabeth! Who knew dinner could be so easy, right? We’re having this dinner again in the coming week. It’s always a hit! Thank you, Julia! I’m so glad that you enjoyed it! I made this tonight and it was amazing!!! I even shared the link with some friends. I made this tonight with mini farfalle and 30 min was perfect. Such a yummy dish! Thank you for the recipe! Great to know! So glad that you enjoyed it, Sarah! Thank you! I wish I would have read the comments first before attempting this recipe. The picture posted with the recipe is a large casserole dish, but in the comments you stated you used a 9×13 pan. Maybe you could edit the recipe so it states that. I’m another person who ended up with crunchy pasta after the 35 minutes because I didn’t use a 9×13. I just put it back in the oven for another half an hour. I hope it turns out okay. Awesome! I’m so glad that you enjoyed it, Diana! I hope that you’ll try some of my other dump-and-bake dishes on the blog, too! So if I were to add onions (new cook here) should i saute them first a little? Or just let them cook with the noodles? I just tried this tonight and it was great. I used the large rectangle dish to cook it in and it was perfect. Since we re two old people it certainly made too much. Any idea if anything changes if I half everything. Wondering about the time if that would stay the same. Hi, Pat! Yes, you can definitely cut the recipe in half and bake it in an 8-inch square pan. The cooking time should be about the same! 🙂 So glad that you enjoyed it! What a great combination of meatballs and rotini pasta! Should i put the leftovers in refrigerator? how long will this dish last? Hi, Lisa! Yes, you can put the leftovers in the refrigerator (or cut the recipe in half and bake it in a smaller dish if you don’t want too much left over). It should keep in the refrigerator for at least a few days! 🙂 Enjoy! I am one of those people that mskes everything from scratch, preps a weeks woeth of dinners to freeze, and makes my own broth. I’m gonna try this using my beef broth instead of water. Also I just prepped this weeks dinners yesterday and had 2 lb homemade meatballs left over. This is perfect. Thanks so much for the recipe. Hi, Lori! I SO admire your time and dedication to making everything from scratch. Your family is so blessed, and I know that it’s not easy. 🙂 I think that your meatballs and homemade stock will be delicious in this recipe. Enjoy! I LOVE, LOVE, LOVE this dish, not having to cook the noodles is awesome and it’s so easy to always keep these ingredients on hand when I need a quick supper. I use a Corningware oval baker and I leave it in the oven for closer to an hour and it works great. Plus, 425F is also the perfect temp for cooking frozen garlic cheese bread so I can just put together a quick salad and have pasta, bread and salad for an easy meal. Plus leftovers heat well for lunches the next day. Seriously, this could be once a week at my house! Christine! I’m so glad that you love the dinner! It’s definitely one of our go-to options as well, because it’s just so darn easy! Thanks so much for sharing your tips about the garlic bread and salad. Such a great meal! This came out perfectly!!!! … I added some cottage cheese in on top before baking. Thanks for posting the recipe! Wonderful! Thanks so much for letting me know, John. Your addition sounds delicious! I am interested in making this recipe. However , I am wondering why it is necessary to thaw the frozen meatballs since it is cooking for awhile. Thanks. It does look delicious! I made this today. Of course, I can NEVER follow a recipe exactly…it’s just not who I am. I only look up recipes for inspiration and then decide how I’ll do it. So…my tweaks: I put the pasta, sauce, and my homemade unsalted chicken broth (instead of water) in the oven for 30 minutes. Meanwhile, sauteed chopped onions on high heat in a cast iron pan just to get a bit of char on them…removed them, then sliced my Costco frozen (thawed) meatballs in half and gave them a char on each side in the same cast iron pan. Took the noodle mix out of the oven (the pasta wasn’t yet done and there was plenty of liquid left in the dish) and stirred in the onions and meatballs. Put the foil back on and baked for about 15 more minutes. Removed the foil….added the shredded cheese on top. Covered that with a mixture of 1 cup Panko bread crumb mixed with 1 tablespoon of melted butter and 1/4 cup grated parmesan cheese. Cranked up the oven to 500 degrees to melt the cheese and brown the panko coating. Took it out and sprinkled fresh sliced basil leaves all over the top. FANTASTIC! My husband, son, grandson, and I all agreed it’s a fantastic dish. One warning…some have asked about doing this in a crockpot. I haven’t but, since I had to leave it in the oven on ‘warm’ because my husband was very late from work, the pasta got a little ‘pasty’. I don’t think this would hold up in a crockpot. Blair…I’ll be trying more of your ideas!! Hey, Debra! Your tweaks sound perfect!!! Thank you so much for sharing! The crumb topping is a great idea! You can never go wrong with some butter, cheese, and breadcrumbs. 🙂 So glad that you enjoyed the meal, and I hope that you’ll try some of our other dump-and-bake dinners as well! Blair – I have a question- Can all the ingredients be mixed together in the pan in the morning, then refrigerated and then baked late afternoon? I have never stirred it all together in advance because I worry that the dried pasta will absorb liquid as it sits and then might have a mushy texture after baking later. If you want to get most of the dish ready in advance, I would stir together the meatballs and liquids in the dish and keep that in the fridge. Then you can just stir in the pasta and cover it right before baking. I want to make this for a friend who just had a baby, I was kind of wanting her to have the option of eating it that night or putting it in the freezer if they aren’t going to eat it that night. Should I cook it completely and then bring it over, or should I just prep it? Would it heat up ok if I baked it fully in the morning and brought it over and then had her put it in her fridge til they were ready to eat at night?…how should I instruct her to reheat it? Thanks in advance! Hey, Kristen! I know that I’ve had friends who have made this dish one night and then had good luck reheating it as leftovers after that. If you want to bake it in advance, I would suggest covering it with foil and baking it in a 350 degree oven for 20-30 minutes, or until just heated through. Here’s the deal, though: I think that this type of dump-and-bake dish is best when it’s assembled just before baking. Since you’re using uncooked pasta, I think that the texture gets a little gummy if it sits around too long (in the fridge or even after baking as leftovers), so it’s just not my preference. – Shop for all of the ingredients and put them in a nice reusable grocery bag. For instance, in the bag you can include the box of pasta, the jar of sauce, the frozen meatballs (measured out into the correct quantity), etc. – I would also put a nice new casserole dish (as a gift) or a disposable foil casserole dish in the bag. – Give her the instructions on how to stir everything together, tell her to cover it, and provide her with the baking instructions. Or just print out the recipe and include it in the bag! 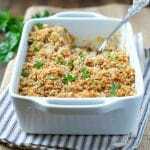 – Then she can stir everything together in the dish and enjoy a fresh, homemade dinner for her family whenever she needs something easy — and you don’t have to worry about the quality of the meal for reheating. I was wondering if this could be modified for the crockpot, or if it would be ok if I prepped it and put it in the fridge so it’s ready for my husband to just put it in the oven. Hi, Lisa! I think that it could probably cook in a Crock Pot too, but I just don’t know what the exact timing would be since I haven’t tried it myself. I am trying this for dinner. I have some picky eaters. So I like the fact the whole family can enjoy this. Everyone loves pasta and meatballs! Can’t wait.. Thank you so much for this recipe. I’m 9 months pregnant with my second child and making freezer meals for after the baby is born. I’m curious if anyone has tried this as a freezer meal; I’m thinking it would be best to cook and then freeze. Any suggestions? Either way, this is going on the menu plan for next week! Hi, Amanda! This recipe is a new mom’s best friend — so easy! I haven’t tried it as a freezer meal because I’ve always been worried that the raw pasta sitting in the liquid for too long will change the texture of the noodles (and maybe make them mushy)? I don’t know for sure…just a guess. How much time do you think it would take in the oven if I put already cooked pasta in? I work almost every ight until after 6. The kids are dying when j get home. If I made this ahead of time and had the kids just pop it in the oven, dinner could be done before I get home. I am just not sure they would be able to check noodle for doneness if I use dry. Hi, Heather! You can definitely use cooked pasta, and it should reheat at 350 degrees F in about 25 minutes (if you’re heating it right away) or in about 35 minutes if you’re cooking it directly from the refrigerator and it’s still cold. You will need to drastically alter the amount of liquid in the dish, though, because the cooked pasta won’t absorb the water like the raw pasta will. I would just use as much marinara as you like when stirring it all together, until it reaches the desired consistency. Cover to bake, and remove the foil at the end of baking to allow the cheese to brown. I’m making this for a friend who needs a little help. What would you recommend for reheating instruction? Hi, Katherine! Personally, I wouldn’t even cook it first. I would just stir everything together in the dish (prepping it for her), and then give it to her to bake fresh at her house. 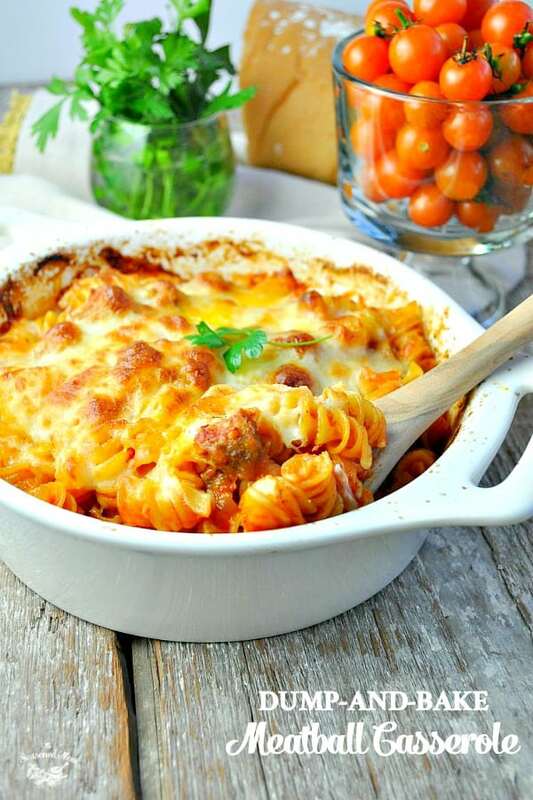 Wanted to make this but cant find fully cooked meatballs in my supermarket, can I cook them in the dish first then add the other ingredients or is them being frozen essential to the cooking times and final texture of the meal? Should I cook them first, then freeze for later maybe? Hi! Love the dish. I was wondering can I make ahead and put in fridge/freezer? If so, what temp do you recommend rehearing and for how long? Covered or uncovered? Sorry , I’m assuming your advice on these questions would be he best! Hi, Eliza! I’ve always been hesitant to assemble this dish in advance because I worry that the uncooked pasta might soak up too much liquid before it goes in the oven, resulting in a mushy or weird texture at the end. I’m not sure if this is the case since I haven’t tried it that way — just a guess. That said, I have had many readers tell me that they enjoy the leftovers reheated. If you bake the dish and then reheat it, I would suggest reheating it at 350 degrees F, covered with foil, for about 20-30 minutes (or until warmed through). Hope that helps! I loved the simplicity of this recipe. It’s super quick and it’s easy to have the ingredients on hand. I loved using Trader Joe’s for these ingredients. They have a 28oz can of marinara sauce which works perfectly AND if you don’t want to bother getting out a measuring cup, use the can! Anyway, I love that I can make sure to have these things on hand waiting for a busy night. Oh and I happened to have a bag of mozzarella but I usually don’t so I would buy a bag keep it in the freezer. I think it would defrost enough if you took it out when you start making the dinner. Oh and I would add a little salt before baking next time. Thanks for the easy recipe! She gave a basic recipe. Based on taste you could add: salt, pepper, basil, red pepper, etc. Her sauce may be more season than yours. All cooks/families have different tastes. Can you put all ingredients in a ziplock bag, except pasta, freeze it. Then thaw it and put it in oven to prep ahead of time? Yes! I think that would work really well, Tia! This was yummy & so easy!!! I need more dinners like this, usually you always have to cook something before adding. I used veggie rotini& it was great. Thanks! This looks delicious. I am.making it now to take to a pot luck dinner at the American Legion. These guys love Italian pasta dinners. I try and find sometging different every week and this hits the make. I know they are just going to love it. Wonderful! I hope that everyone enjoys it, Judy! I do a version of this, but don’t even cook the meat. Just place ground turkey or beef in with pasta & cover it with the sauce. It turns out perfect every time. I even set it on the time bake while at church & it’s ready when we get home! I can’t wait to try this. Sorry new cook here! I purchased pre made meatballs from the store that are raw and need to be cooked. Do I bake them in the oven first and then add them to this meal like in the recipe? Hi, Beth! Yes, you’ll want to use fully cooked meatballs in this recipe. If you’re starting with raw meatballs, just bake them in the oven according to the package instructions. Then proceed with the recipe as written. Hope that helps, and enjoy! 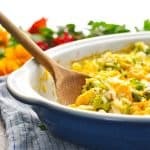 Could you recommend how to adjust the recipe (if it would need any changes at all) if I wanted to add spinach or other vegetables, such as diced zucchini? I would think it would work if I just mixed the veggies in before baking, but I would appreciate any suggestions you may have! Also, I’m open to ideas of other vegetables you think would work with this meal, please. Hey, Rachel! I think you can definitely add just about any of your family’s favorite veggies. Zucchini is a great idea! I would just stir it in with the rest of the ingredients right before baking. Enjoy! This recipe looks great! I am trying it tonight and am so excited! I do have one question; Could I use veggie-based noodles and still cook for the same time, or does the recipe call for normal noodles? Hi, Devan! This recipe calls for regular noodles, so I haven’t tested it with veggie-based noodles. Are you referring to dry pasta noodles, or something like zucchini noodles? If you’re using zucchini noodles, then the recipe will not work because you need a dry pasta to absorb most of the liquid. If you’re using a more traditional dry pasta, it should work fine — so long as the cooking time for the dry pasta is about the same as the short pasta used in the recipe. Hope that helps! Hi, Elizabeth! Yes, I think it could, but I’ve never actually tried it myself, so I couldn’t give you any specific cooking times. Just be careful not to overcook the pasta in the slow cooker or it will become mushy. I had a idea for a pre-Thanksgiving dinner, work in the kitchen kinda night. I ran into your site by accident and so happy I did! My youngest just arrived from his duty station for the holiday and wifey isn’t home from work. I threw this together exactly as you have it. We really like this so much that it will definitely be a quick go to in the future. I personally loved it so much I signed up for your newsletter. Yes ma’am this old man is the cook in this house, gotta keep honey happy!!! 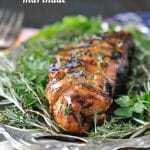 Thank you for this fabulous easy recipe and looking forward to spending more time on your site. Happy Thanksgiving 2018 to you and your family! Hi, Michael! I’m so glad that you and your family enjoyed the dinner. Thank you so much for your kind words, and happy Thanksgiving to you as well! Loved this. Have to say, anytime I do not have to boil pasta first, I’m in! Look forward to trying many more of your recipes, mainly for quick weeknight meals. I was intrigued in your site theseasonedmom.com because of the exquisite oriented info and sensations it displayed. This recipe is a definite keeper. I doubled the recipe for a pot luck and added a bag of Italian vegetables. Came out great. Thank you so much for all your great receipts!! So helpful and yummy!! Could you use Alfredo sauce instead of marinara? I needed a dish to take to a friend who had a death in the family. As I had never made this before, tried it out first on my own family. Followed recipe exactly and it turned out great. My 12 year old asked if I could make it every week. Will be making it again tomorrow to take to my friend. Thanks for this easy but tasty recipe! That’s wonderful, Kristine! Thank you! Made this exactly as written and we both enjoyed it very much! So fast and easy to make–love that! I often find that the prep time given in recipes is less than what it takes me to prep, but not this one! 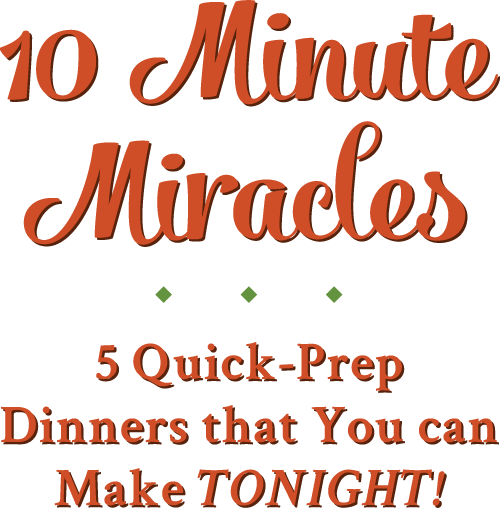 In fact, it was prepped and ready in about five minutes–before my oven was even preheated! Makes a lot so plenty for leftovers which we love. Thanks for another great recipe Blair! A wonderful recipe, thanks for sharing your information. Not a good cook, but i’m gonna try this one. I’m not the greatest cook and always question myself. I’m going to try this recipe for the first time. Are the noodles suppose to be completely submerged in the water/marinara or will this still cook appropriately because the tin foil will be covering it? I feel embarrassed asking. Love this! 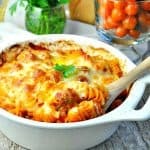 It has become my go-to meal to make when I didn’t have a plan and I need something easy that I know the kids will love. It is my son’s favorite meal! That’s awesome! Thank you so much, Jessica! I made this last night and hubby and I loved it. Thank you so much for sharing this recipe.. It’s definitely going into rotation at our house. I totally agree! Thank you so much< Karyn!